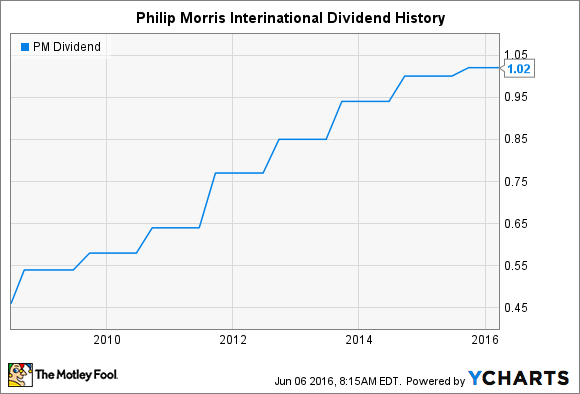 Will Philip Morris International Raise Its Dividend Soon? Dividend investors want to know if the international tobacco giant will keep its payout-increase streak alive. Among tobacco stocks, Philip Morris International (NYSE:PM) hasn't been around all that long as a separately traded company. Nevertheless, in the long tradition of its peers, Philip Morris has rewarded its shareholders with lucrative dividend payments, and the company has also found ways to increase its payouts year in and year out over nearly a decade. With the tobacco-grower historically raising its dividend in the late summer, some investors are getting antsy to discover whether Philip Morris will be able to overcome some of its challenges to push ahead. Let's look more closely at Philip Morris International and whether a dividend increase is in the cards for later this year. Can Philip Morris International keep investors satisfied? Philip Morris was aggressive with its dividend increases when it first became a separately traded company. After debuting in early 2008, the stock immediately gave investors a 17% boost to the dividend later that year. With the exception of a smaller increase in the financial-crisis year of 2009, Philip Morris was able to deliver double-digit percentage increases through 2013, with an extremely generous 20% jump in 2011. The past two years, however, haven't been as kind to Philip Morris shareholders. Earnings growth slowed largely as a result of the strong U.S. dollar compared to the international currencies that the tobacco giant takes in as revenue. That prompted Philip Morris to limit its 2014 dividend increase to just 6%, and its 2015 boost was even smaller at 2%. Moreover, one problem that Philip Morris is having right now is that it's already pushing the limits of how much it can afford to pay out in dividends on a sustainable basis. Based on its most recent trailing earnings, the tobacco giant is paying out more than 95% of its earnings in the form of dividends. That has led Philip Morris to suspend the stock buybacks it had used in the past in order to preserve capital to go toward dividend payments. Are things looking better for Philip Morris International's dividend? The good news for Philip Morris is that some of the negative factors that have held back its growth appear to be subsiding. Most important is the direction of the U.S. dollar, which has finally seen a pause in its strengthening trend against the euro and has actually fallen against the Japanese yen. Even flat performance would allow more of Philip Morris' organic growth to reach the bottom line. For example, in its most recent quarter, the tobacco company took a $0.37 per share hit to earnings because of the strong dollar, costing the company 18 percentage points of revenue or roughly $1.4 billion. If that negative goes away, then it could mean more available money to give to shareholders. That said, Philip Morris is dealing with new challenges. The spread of tighter regulation across the globe is continuing, and plain-packaging restrictions are becoming more common. It's unclear what impact that could have on profits for the cigarette seller, but the trend only highlights the need for Philip Morris to look at alternatives like its reduced-risk product portfolio in development. Based on what Philip Morris has done in the past, a boost is likely in September, but enough headwinds exist that it will probably be another small increase. Even pushing the dividend up another $0.02 to $1.04 per share quarterly would keep its yield above 4%, and that's a respectable payout in today's market that should keep income investors satisfied with Philip Morris International for another year.